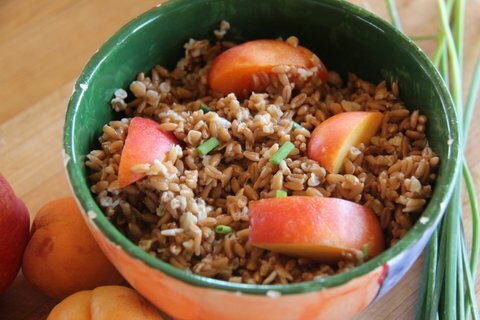 This farro salad recipe makes wonderful use of stone fruits such as nectarines, peaches or plums. Boil Bluebird Farro in salted water until tender, approximately 50 minutes. Drain and cool. Shave fennel and radish. Slice stone fruit. Grill flesh-side down for 1-1.5 minutes until showing grill marks but still firm. Quarter the halves. Chop herbs. Juice and zest the lemon. Mince shallot. Combine all ingredients together, add salt and pepper to taste. Serve at room temperature.